Teresa Edwards is a retired women's basketball player who is considered one of the greatest female athletes of all time. Edwards won five Olympic medals during her international basketball career, including four golds. She is currently serving as the interim head coach of the WNBA's Tulsa Shock. Edwards was inducted into the Naismith Memorial Basketball Hall of Fame in 2011. Edwards was born in Cairo, Ga., and played for Cairo High School, where she was a four-year starter. She led Cairo to a 58-3 record over her final two seasons, finishing her high school career with 1,982 points. After being named Georgia High School Player of the Year, Edwards chose to attend the University of Georgia. Edwards continued her success with the Bulldogs, leading them to their first Final Four appearance as a freshman in 1983. Edwards and the Bulldogs returned to the Final Four in 1985, where they fell to Old Dominion in the championship game. During Edwards' four-year career at Georgia, the Bulldogs went 116-17 and won three SEC championships. Edwards was a two-time All-America selection, finishing her college career with 1,989 points, 653 assists and 342 steals. With no professional league in the United States at the time of her graduation, Edwards went overseas, where she became a star in Italy, Japan, Spain, France and Russia. In the mid-1990s, Edwards returned to the U.S., serving on the board of directors for the new American Basketball League. Edwards joined the Atlanta Glory, and was the runner-up for MVP honors in the league's inaugural season, finishing with 21.1 points, 6.7 rebounds and 2.3 steals per game. The following season, she led the league in assists and finished third in scoring, while also serving as the team's player/coach. When Atlanta folded before the 1998-99 season, Edwards joined the Philadelphia Rage. She was leading the league in scoring when the ABL ceased operations. When the league folded, Edwards chose to return overseas rather than jump to the WNBA. In 2003, she finally made her long-awaited WNBA debut, as a 38-year-old rookie for the Minnesota Lynx. Edwards played two seasons for Minnesota, starting all 68 games for the team in that span. The Lynx made the playoffs in both of Edwards' seasons with the team. Edwards represented Team USA in nearly every significant international competition between 1984 and 2000, playing an incredible 216 games for the U.S. national team. She won 14 gold medals during her international career, including four at the Olympics. Edwards made her Olympic team debut in 1984, following her sophomore year at Georgia. She became the youngest woman to win a gold medal for basketball, as the U.S. went undefeated. She earned gold again in 1988, 1996 and 2000, becoming the oldest woman to win a gold for basketball at the Sydney Games. During her career, Team USA went 205-14. At the Summer Olympics in Atlanta in 1996, Edwards was chosen from the 10,318 athletes to read the Athlete's Oath at the Opening Ceremony. Edwards made her coaching debut in 1997, serving as a player/coach for the Atlanta Glory of the ABL. The Glory went 15-29 during Edwards' lone season at the helm. 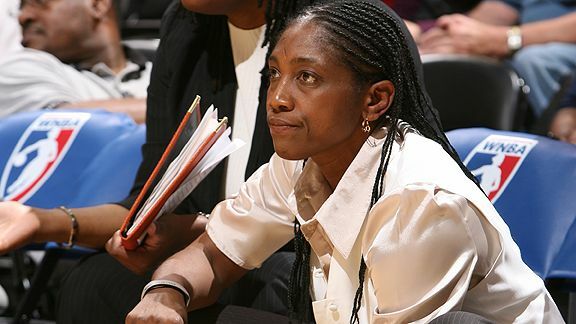 Edwards returned to the coaching ranks in 2007 as an assistant for the Minnesota Lynx. She joined the Tulsa Shock in November 2010, and was elevated to interim head coach when Nolan Richardson resigned in July. Edwards had her No. 5 jersey retired by the University of Georgia, making her one of only three Lady Bulldogs to receive that honor. In 2010, she was inducted into the Women's Basketball Hall of Fame, and earned induction into the Naismith Memorial Basketball Hall of Fame a year later. In 2011, she was also honored with a Silver Anniversary Award by the NCAA.